After working on this project for over a year, here's the finished film. I hope you'll enjoy it. Now here's the story behind it. In 2015 I bought Chaosium's collection of Hastur-related tales, and found among them Lin Carter's poem "The King In Tatters." I thought it was very atmospheric, and offered many interesting visuals, if one were to adapt it as a film. I contacted Robert M Price, who is the manager of the Lin Carter estate, and he generously gave me the permission to make a filmed version for YouTube. 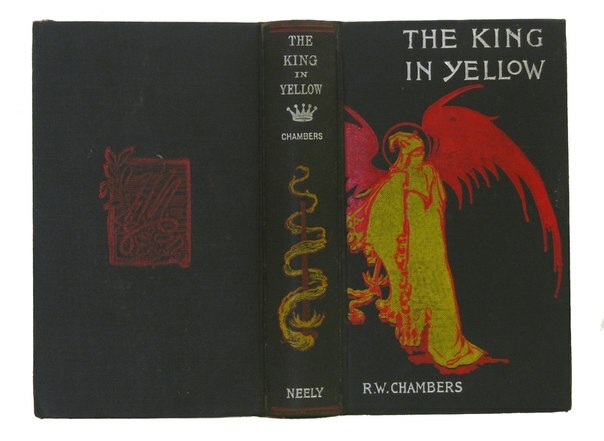 Originally "The King In Yellow" is a book by Robert W Chambers, first published in 1895. For a book of that age it's very modern, and collects a number of more or less weird stories. 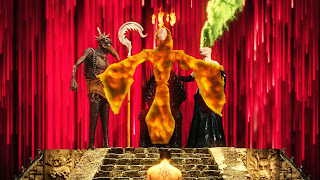 Some of them circle around a fictional play, "The King In Yellow", a work said to drive people insane with its second act. The text alludes to a place called Carcosa, and a mysterious king with a pallid mask. 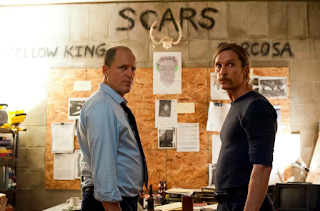 Other writers after Chambers have expanded the rather impenetrable hints given by the original author, and the world of Carcosa and its inhabitants have been gradually fleshed out. 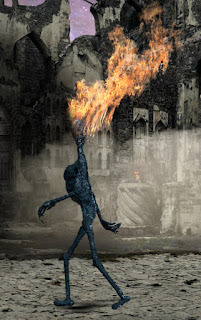 It has been given a mythos of its own, though it is sometimes included into the Lovecraftian Cthulhu mythos, basically created by Lovecraft's protegé August Derleth, and not always for the best. In the same way Chambers´ mysterious dreamlike references to Carcosa and the King In Yellow has been given a tad too much clarity sometimes. 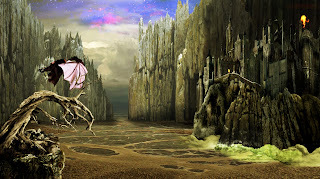 Not surprisingly, this mythos has been incorporated into RGPs, just like Lovecraft's world. 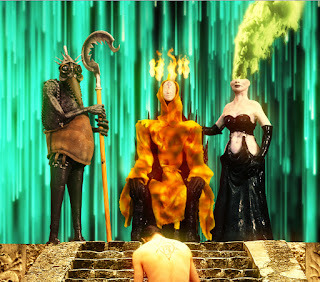 The King In Yellow also pops up in various other pop culture phenomena, most recently in the first season of "True Detective." There have also been comic book adaptations, and various amateur film efforts. 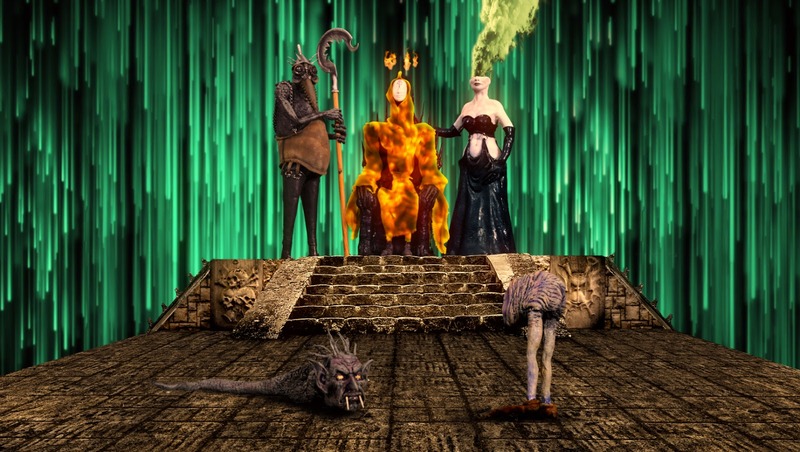 My version of the world of Carcosa began taking shape last September, when I filmed Samuel Lange, the friend of a friend (but now also my friend) as the narrator of the poem; a man who seeks forbidden knowledge through arcane practises. As the weather was fair we shot all of his scenes outdoors, with my greenscreen slung over a light erector set. Samuel costume was pieced together from a number of things. The boots are riding boots bought at a garage sale. His pants were salvaged from a closed-down stage wardrobe. The red robe is a gospel choir robe bought from the Swedish equivalent of eBay; Tradera. And the sword is a Greek "kopis" or "falcata" made from aluminum and brass by my blacksmith buddy Martin Merkel. 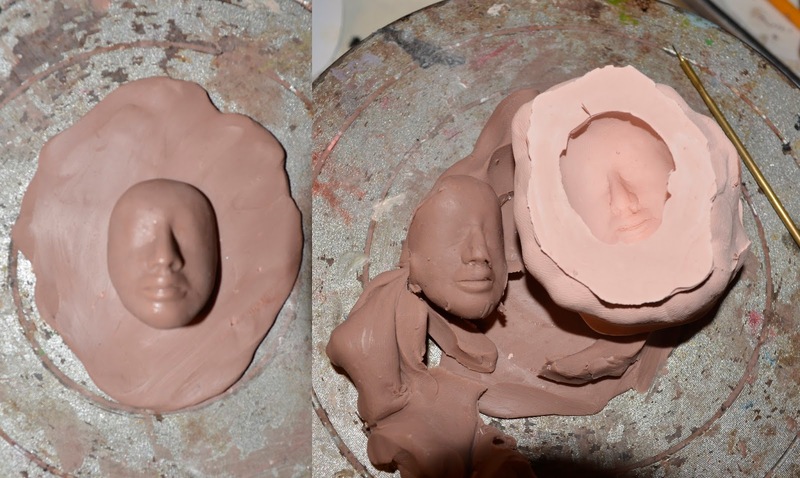 The only thing created especially for this project is the pendant, sculpted in clay and cast in 325 SmoothCast plastic from a silicone mold. 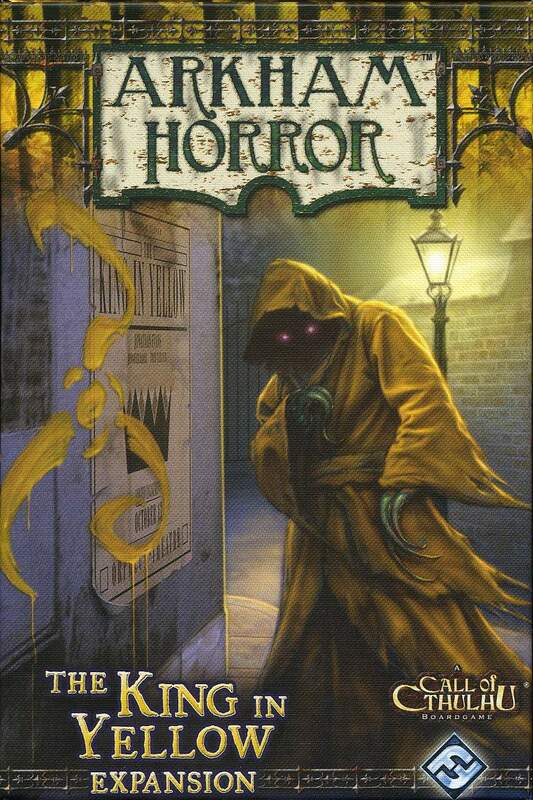 It sports the classic Hastur sign, made popular by Chaosium's RPGs and then other illustrators. It was silly going for the most well-known version of "The Yellow Sign." 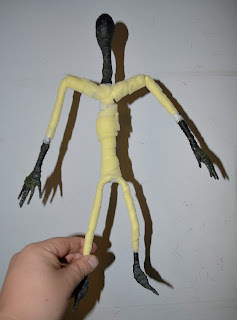 I should've made my own version, which I eventually did for the Hastur puppet. Let's just say that its inclusion in the film is because Samuel's occult cultist is a fan boy, and that he, like me, didn't know any better. What I had no idea about when asking Samuel to join my project, was that he actually had two big occult tattoos on his body; a pentagram on his chest, and an image of black magic bad boy Aleister Crowley on his back! I guess fate was in play, or as the poem says: "Fate, or my stars, or some accursed pride had brought me here." 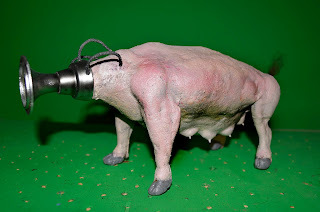 The only complicated shot in the film (which wasn't really complicated) is when the character mounts his interstellar ride, the Byakhee. 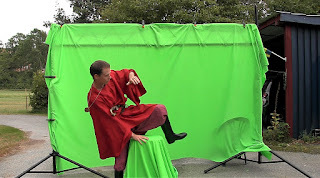 Samuel just straddled a bar stool covered with green screen fabric, and I was later able to place him on the back of the Byakhee puppet. 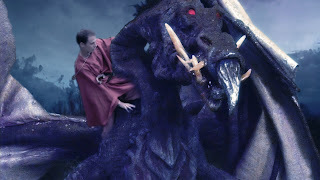 Some masking in After Effects placed him behind the neck of the monster, though he was really superimposed on top of it. When the Byakhee is in flight and seen from afar I just printed out a small still image of Samuel, cut it out and taped it down onto the back of the puppet. The simplest solutions are always the best. 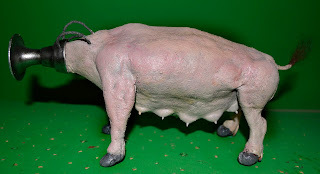 The only exception to this is this shot, where the Byakhee has a paper cut out of Samuel's legs on its back, while the torso of the live-action Samuel is keyed in on top of the cut out legs. I did this in order to have some subtle movement in his robe and from his head during the shot. It's there, though hardly noticeable. I'd like to think it still helps sell the illusion. 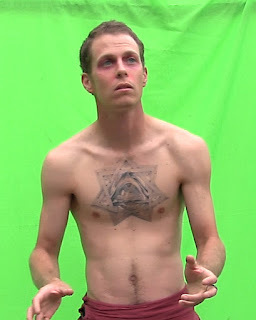 I hand tracked Samuel's torso in After Effects, also using the masking tool to place him behind the neck of the puppet. As usual, I'm shamelessly using tons of stock footage from Videoblocks and Pond5. They have a wealth of atmospheric nature footage, which can be dropped into my film with hardly any additions, except for a few filters. I'm subscribing to Videoblocks yearly, and it's so much quicker and easier for me to log in, find what I need and continue editing, than going out with my own camera, trying to film the backgrounds that I want. I do, however, piece together my own "matte paintings" in Photoshop. 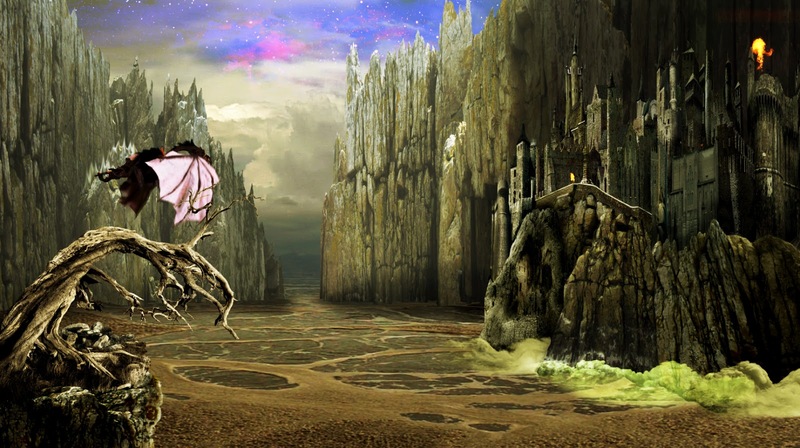 The example above shows the palace of the King emerging from the Lake of Hali (another name-drop from the Carcosa mythos). There is about eight layers to this shot. All the cliff faces are photos I took of rocks by the sea in the south of Sweden, the castle is a mix of stock photos of various ruins, and the tree is another stock photo. The sky is a mix of a Nasa space photo and stock footage time-lapse clouds. 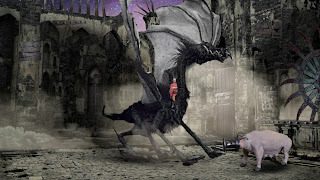 The lake itself is footage from a sewage plant, with stock smoke shots added around the base of the castle cliff, with fires shot against black from Detonationfilms coming out of the castle towers. All of it is, of course, brought together in After Effects. And as usual, the narration for the film is provided by my trusty voice-over guy John Hutch, recorded while on vacation in Spain, no less. After I had shot the footage with Samuel, which only took a couple of hours, and had to let go of the project for quite a while. I was at the time working on a media project for disabled people, which started to eat up almost all of my time, even on supposedly off work hours. 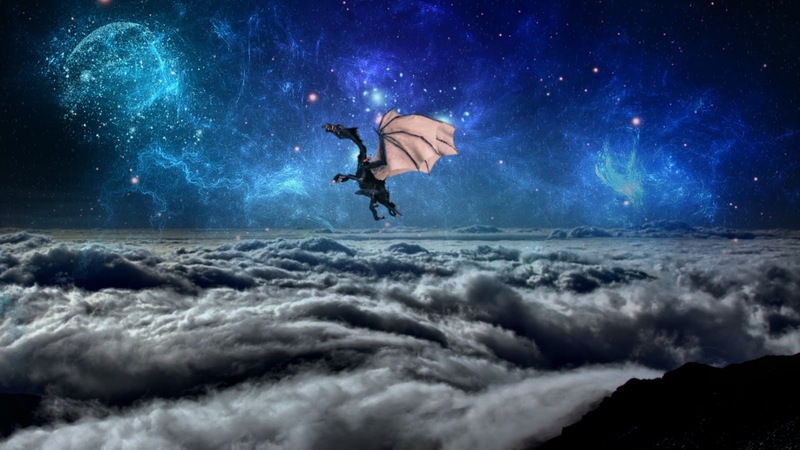 As this project wound down in April I found myself hurled out into the world of unemployment again, and vast vistas of free time opened up before me. Still, putting together all the bits of the film, building the puppets and animating them, dealing with wonky technology and other issues, made this production a very lengthy one. again, I've learned a lot from it, and I'll take it with me to the next film. As I write this, my Carcosa film project, finally named "In the Court of the Yellow King", is actually finished. My top level Patreon supporters were given a premiere viewing of the film a couple of days ago as a part of their bonus reward. But I will make the film public on YouTube this weekend, and hopefully you'll enjoy it. Until then, here's some info on the last trio of puppets built and animated for this project. I wanted to add at least one citizen of Carcosa, someone casually drifting by the camera, and came up with a VERY simply constructed character. 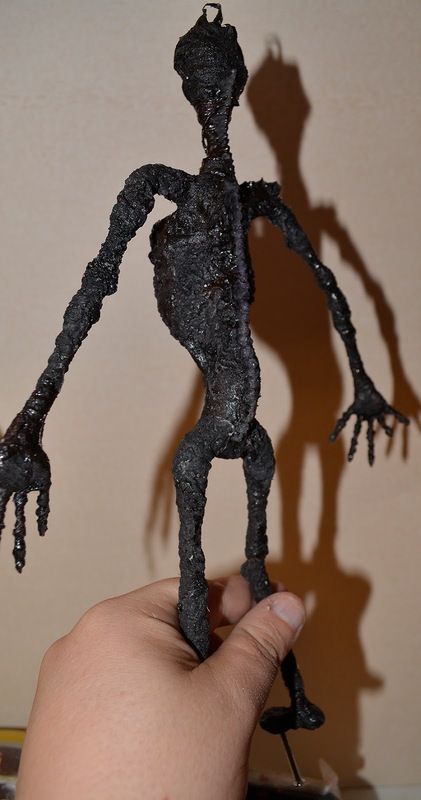 Basically he's an unwrapped mummy, with his head on fire, going somewhere. I slapped together this armature out of thermoplastic and aluminum wires. As usual there are wing nuts in the feet for tie-down purposes. 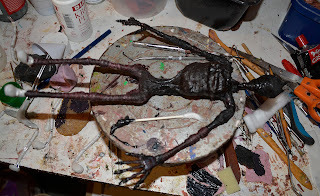 The whole puppet was covered with soft yarn and cotton dipped in tinted latex. I basically let the materials create the textures, with some gently prodding from me and a pointy sculpting tool. It wasn't really necessary, but I chose to cast some additional latex textures from old plaster molds, and added those here and there. More tinted latex was sponged on to make the colors more unified. And here's our dapper chap, walking through the street of Carcosa City. I added the fire to his head by using stock footage of a burning brush shot against a black background, and superimposing it over the animated puppet, using the tracking tool in After Effects to make it follow the character's head. 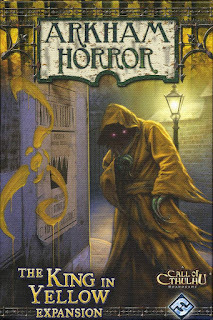 Finally, finally, the main character (and we, the audience) reach the throne of Hastur; the King In Yellow. I decided to give him a consort; an attractive, but in some way weird lady. 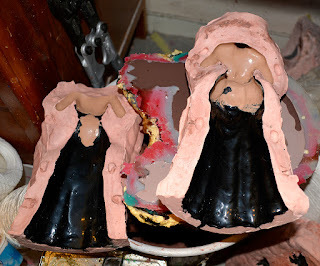 For a while I thought about asking one of my lady friends to portray her, but then I decided against it, thinking that I'd have greater control over the clothes she'd wear if I made her as a puppet. This character wasn't required to do much, just turning her head, actually. 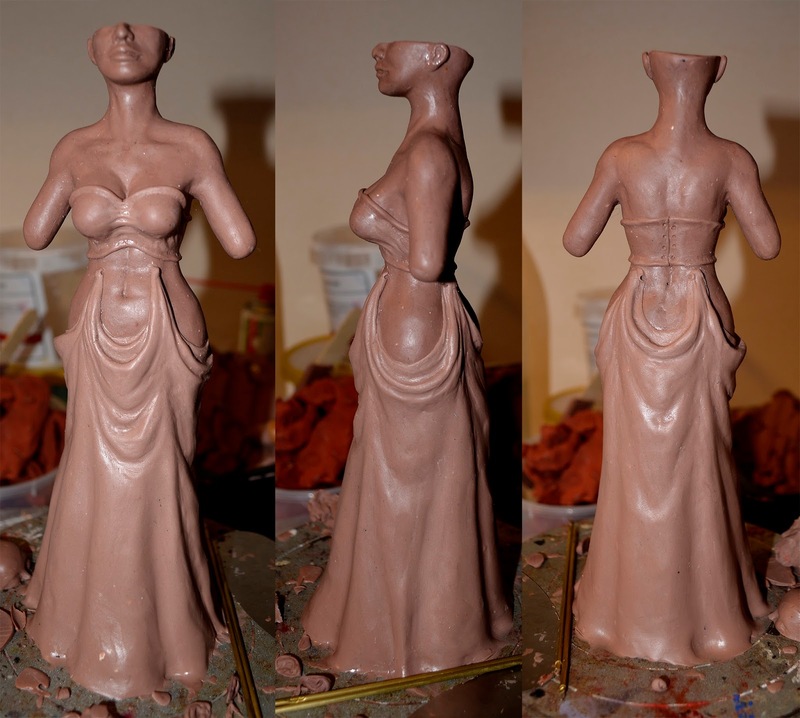 So I made a torso sculpt of a voluptuous woman in medium grade Monster Clay. To this torso I added the skimpy clothes using soft Monster Clay, as it's a faster material to sculpt and smooth out that the medium grade variety. By now I had decided to slice off the top of her head and have nasty green smoke come out of her skull. 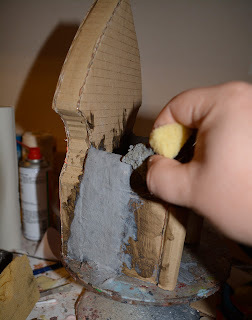 I also used the soft Monster Clay to create a dividing wall for the mold making. 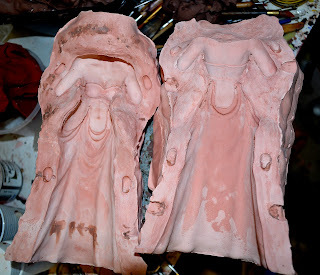 Here's the front half of the mold made out of pink dental plaster. 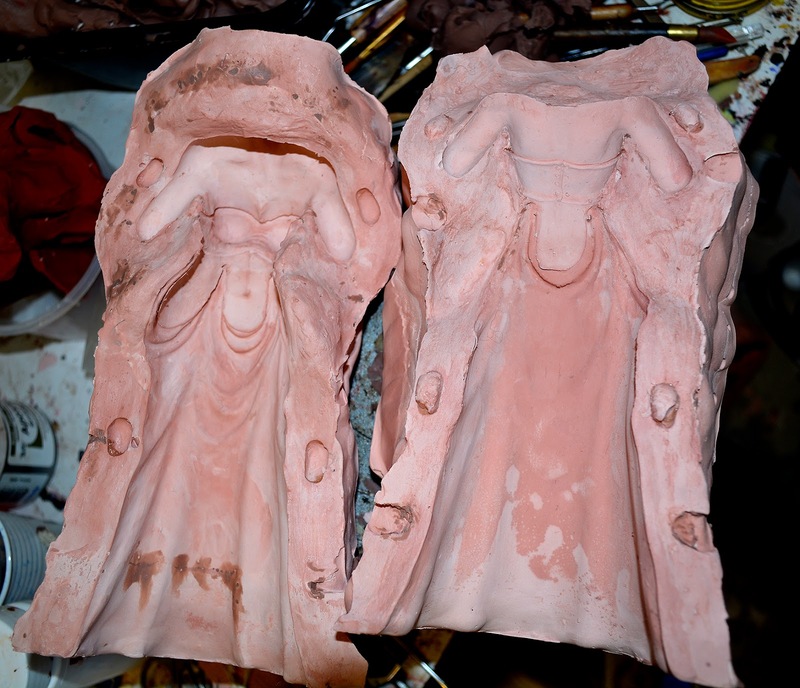 And here's the finished two-part mold, with the clay cleaned out. 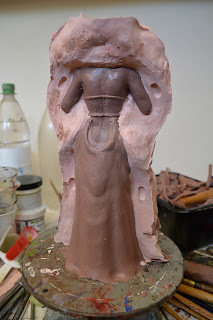 The string of clay smudges at the bottom of the left half are put there by me to cover some air bubble pockets that unfortunately slipped through. All the bare skin parts of the puppet were painted in with flesh-colored latex into the mold using pipe cleaners, while the dress bits were painted a leathery black. 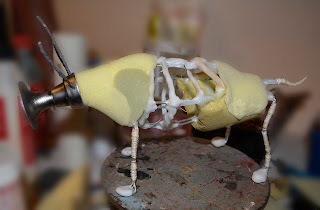 After this initial latex layer had set up the mold was closed up and held together with straps, while more latex was poured into the mold and sloshed around to add a thicker skin. 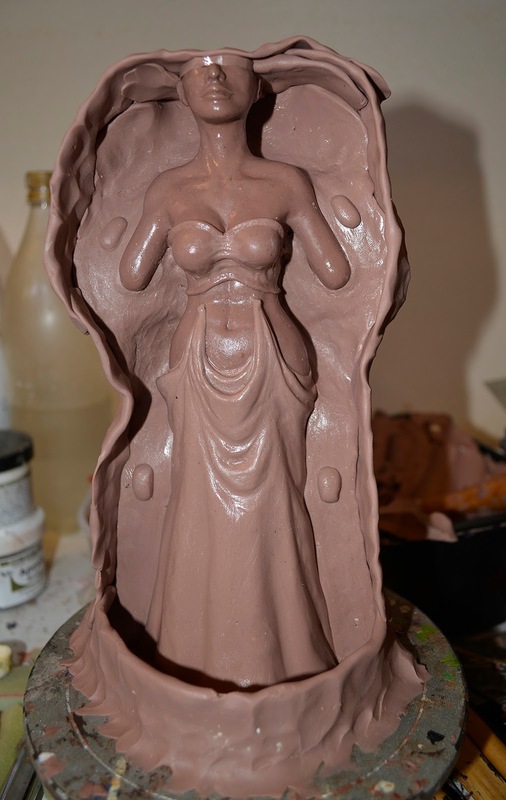 Here's how the "queen" looked right after coming out of the mold. As you can see there is a fair bit of "flashing" where the latex has seeped into the seam of the mold. 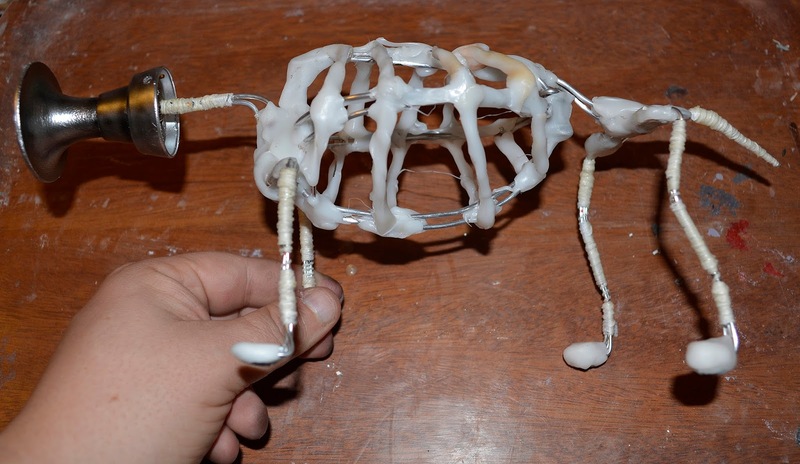 To support the puppet a thick piece of aluminum wire goes front the feet right up to the top of the head. 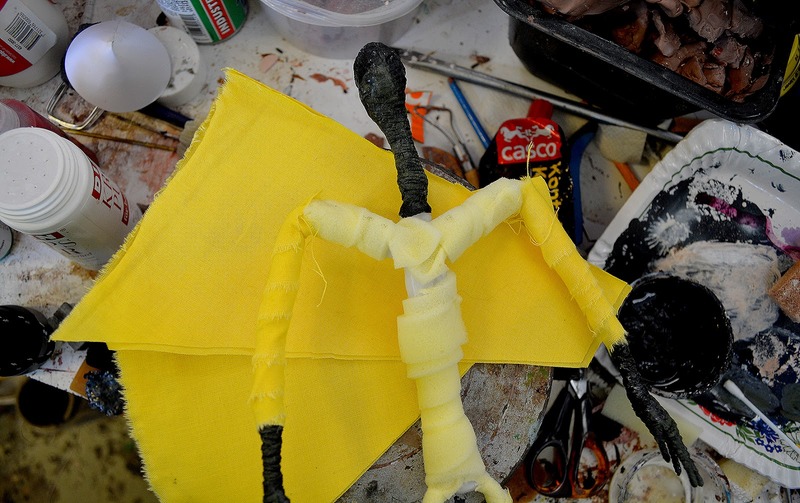 Armatured arms have been added and covered with soft yarn and tinted latex. 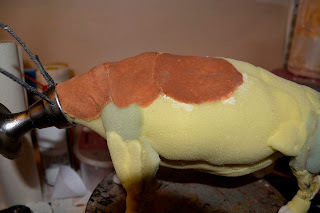 The seam flashing has been cut, and the marks left by it have been covered with liquid latex. 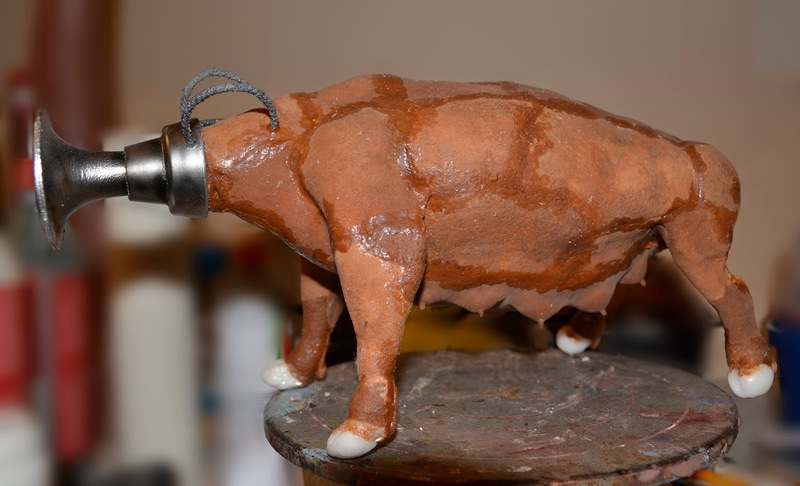 Here she is with a finished paint job using PAX paint (Prosaide makeup glue + acrylic paints). 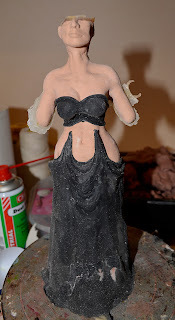 The rings connecting her top with the skirt are bits of yarn dipped in latex and painted with metallic colors. For the king I actually started with his throne. I made it out of old cardboard boxes held together with lots of hot melt glue. It was a very quick build, and this is what I ended up with for the basic shape. To give the throne a bit of texture I created a scaly pattern in soft hobby clay using one of my sculpting tools. Over this pattern I added a layer of tinted latex using a polyurethane sponge, and reinforced the latex with tissue paper and more latex. 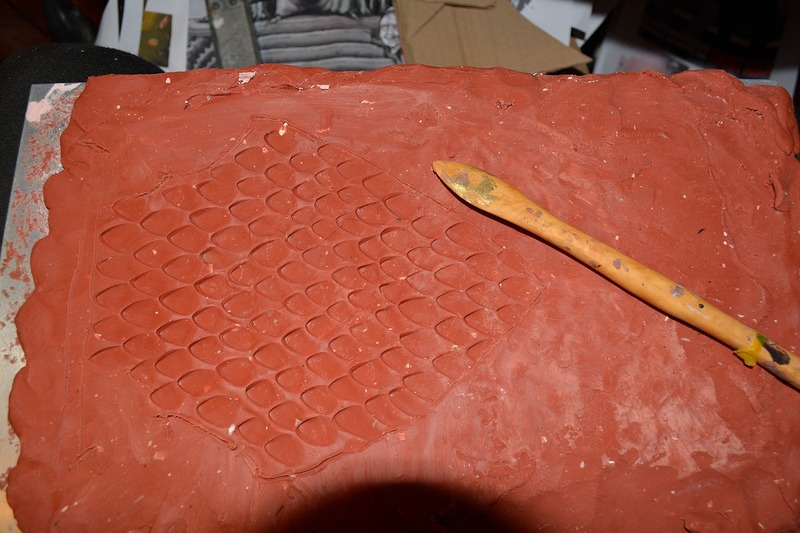 Thus the negative imprints in the clay turned into a positive latex cast. 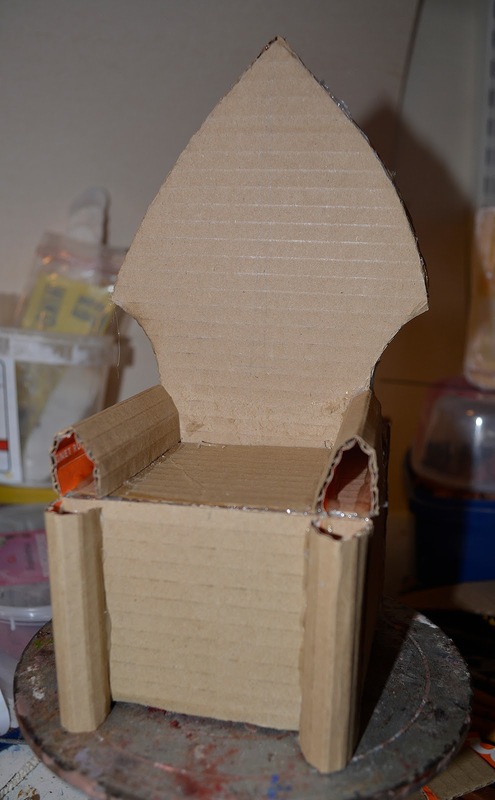 The whole cardboard throne was covered with latex and cotton dipped in tinted latex. This added subtle organic textures to the prop. 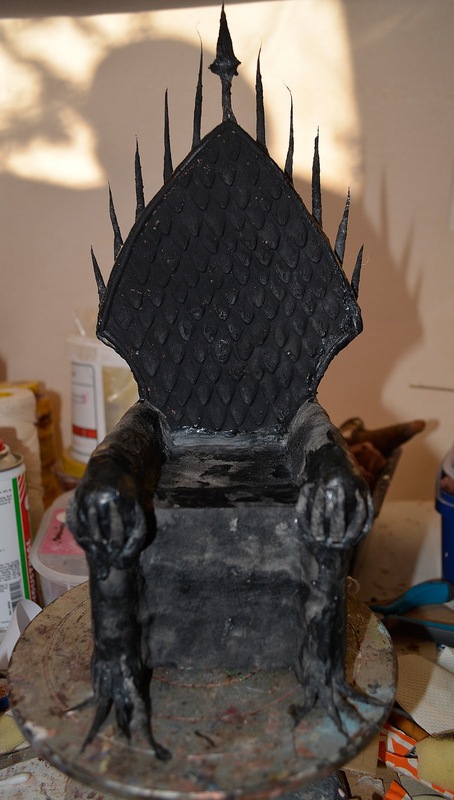 Cotton and latex were also used to create other decorations, such as fingers reaching up onto the armrests from below, and a row of spikes on top of the back rest. The armature for the king was super simple. No facial features and a very basic humanoid shape. 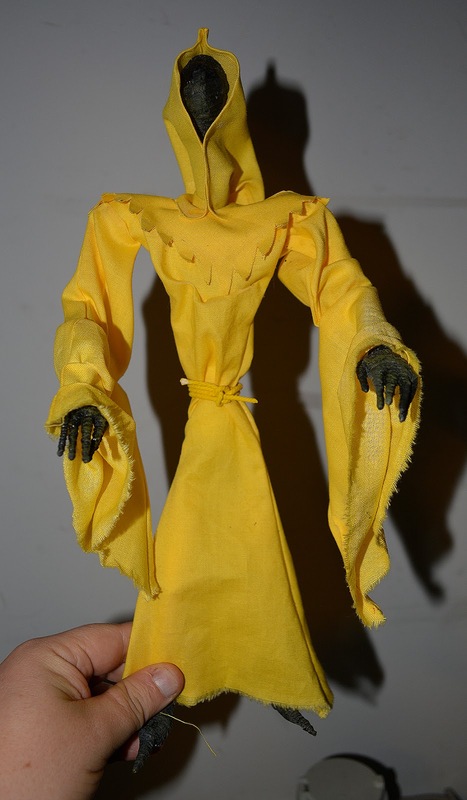 I was going to cover up the puppet in robes with very little padding, but I also wanted his dimensions to be slightly distorted, hinting that it wasn't anything human at all under the clothes. 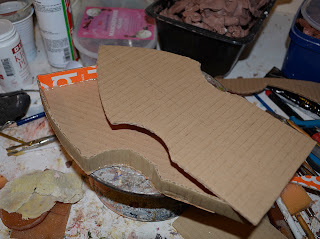 This is the simple padding, using strips of thin polyurethane foam. I've covered the feet, forearms and head with soft yarn and tinted latex. I chose a very bright yellow fabric for the robe, and again the shapes used to make the robe was very simple. The finished robe, with a little waist cord made from thick yarn dipped in latex tinted yellow using Monster Makers´ latex tints. 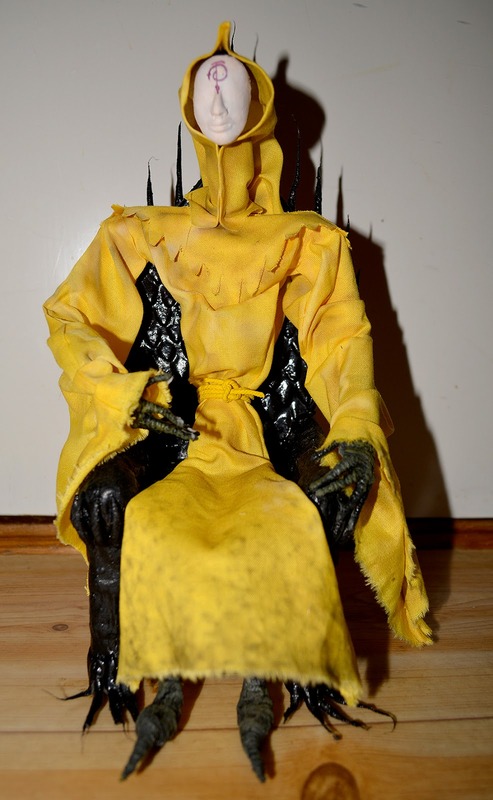 In all stories concerning the King In Yellow he's said to wear a pallid mask. I decided to make my version of the mask eye-less, to further augment the character's inhuman features. 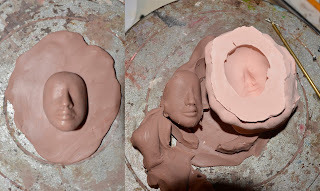 I sculpted a simple neutral face in soft Monster Clay and cast a plaster mold over it. 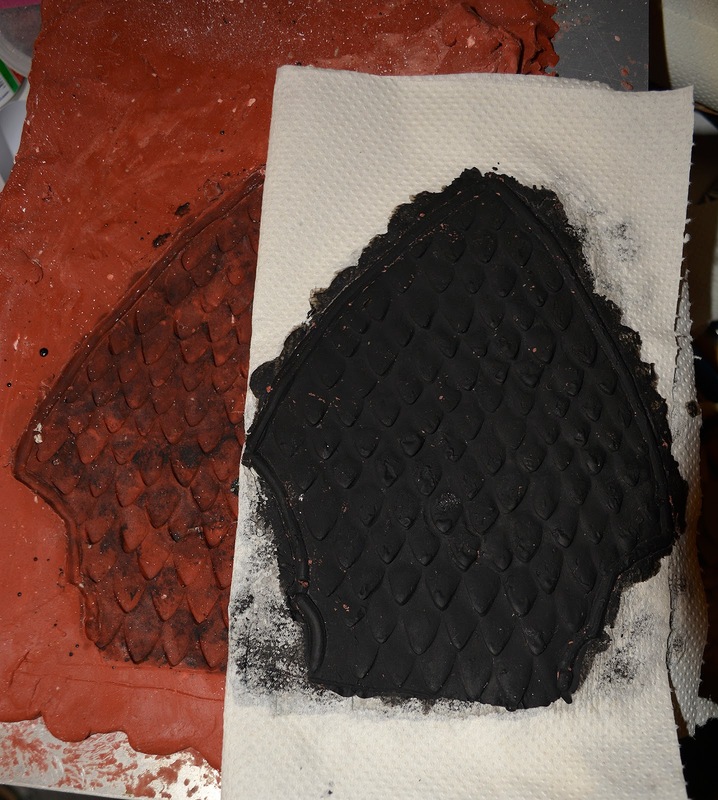 Tinted latex reinforced with cotton was cast into this mold to create a feather-light leathery mask. 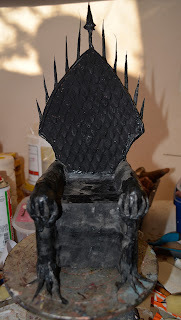 Here's the monarch seated on his throne with mask on and some airbrushing added to his robe. In the finished film I've added cgi stock footage of wiggling organic shapes over the yellow robe, and used the masking tool in After Effects and hand-made tracking to make the footage envelop and follow the robe. Just a bit of extra added weirdness. I also placed a rotating crown of fire over his head, using footage of a torch filmed against a black background and animating several layers of this torch into a "circle". The guard you might've read about in an earlier blog post is joining the king, and the queen has her column of green smoke added to the top of her head. The background is a digital animation of long ribbons running downwards and changing color. All in all this has been a fun project, but lots more work that I had anticipated when I initially planned it out. More and more details were added, and every one of them ate up more time. I've learned a lot from doing this film, and in the end that's the big payoff. I was so busy with other things that I didn't manage to get a single post up during October. Bad form, indeed! I hope I can make up for that this month. I'm almost done with my Carcosa film project; "In the Court of the Yellow King." But I find myself still building the world, adding more and more details and characters to the backgrounds. It's time to give it a rest. But before that, here's yet another monster! I'm making a scene set in a town square (of sorts) and I needed to populate it with at least a couple of living things. This puppet is supposed to represent livestock and domesticated critters in Carcosa; basically a pig body with a strange artificial head. 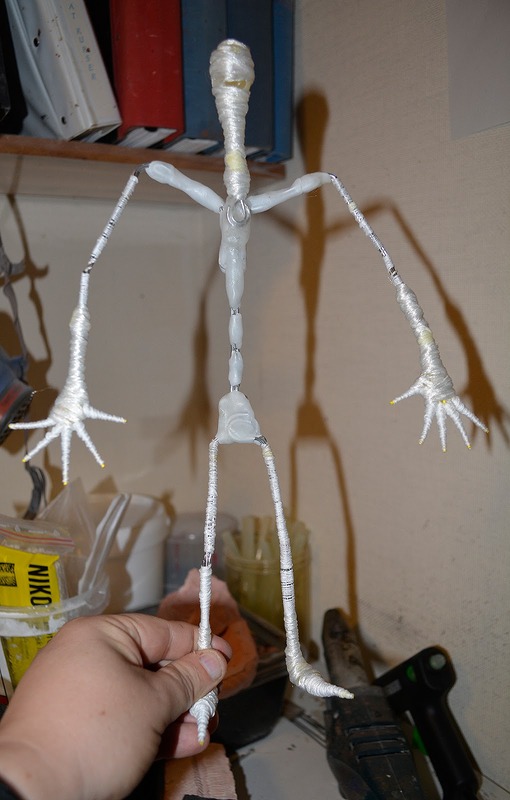 My armature is the basic type I always build, using thermoplastic (the white stuff) and aluminum wires. 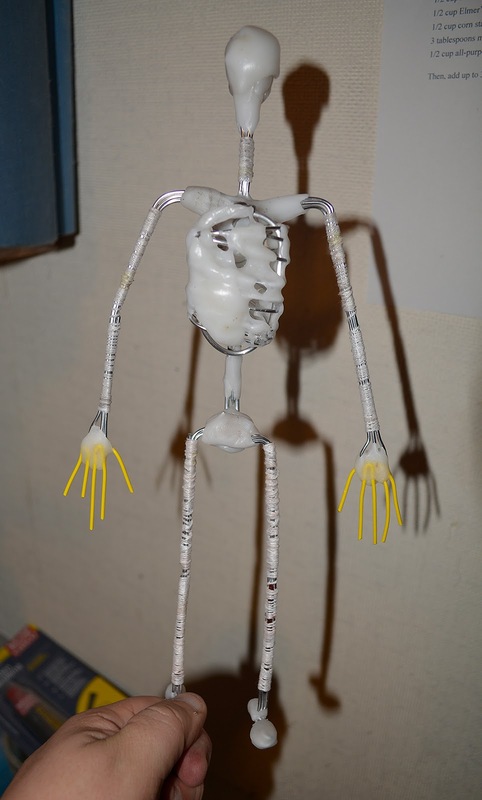 But this time I decided to build up a rib cage to make the body sturdier, and to give me something solid to grab hold of while animating. 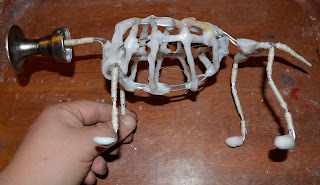 It's basically aluminum wires wound around the spine, and covered with thermoplastic. 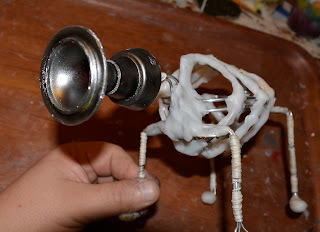 The funnel-shaped head is at the back the top of a whipped cream can, and the front is what's left of a toy plastic tuba I've had since I was very small. The tuba broke many, many years ago, but I saved the top of it. Almost all of this puppet was covered with thin sheets of polyurethane foam. Only the rump of the monster was provided with a bigger foam piece. 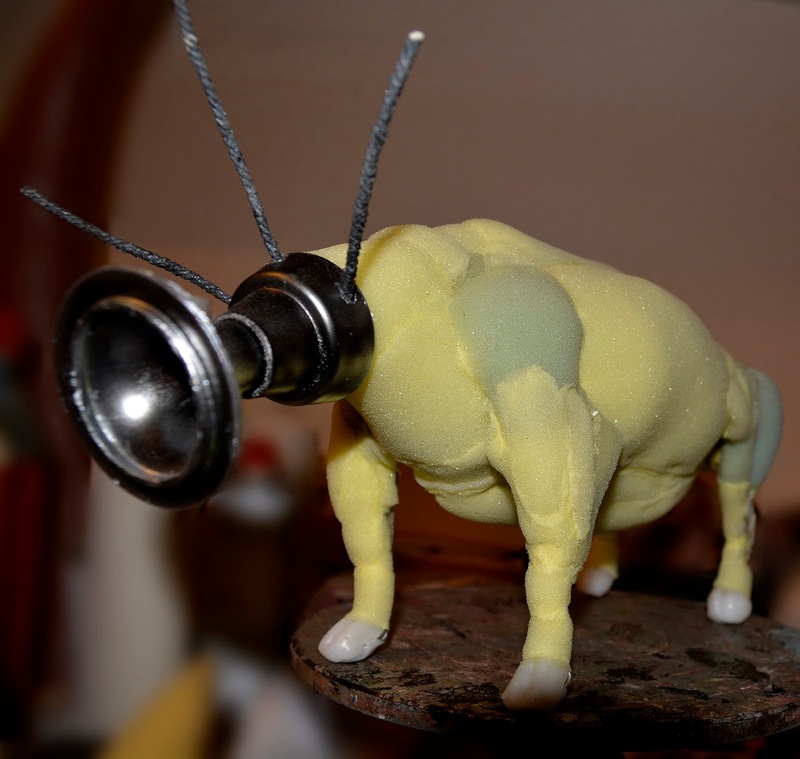 Here's the finished muscle build-up. As you can hopefully see it's quite subtle, and partially based on the muscle diagram of a real pig. The green foam is slightly thicker and denser than the yellow. 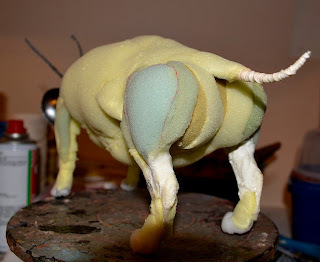 The back haunches have been partially shaped with cotton dipped in latex. The body was then covered by fairly small patches of latex skin cast in a plaster skin texture mold. If I remember correctly, the skin mold was created off an old orange skin. Using smaller latex patches creates a smoother, leaner look to the surface, but it also means more seams that need covering. 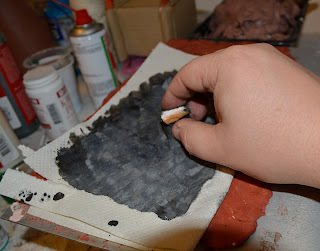 I used a pipe cleaner to brush on tinted latex in very thin layers, and a pointy sculpting tool to poke pores into the latex seam coverings, making them blend better with the rest of the skin surface. 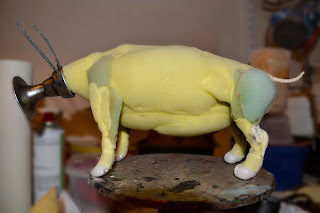 The finished puppet is painted with PAX paint (Prosaide glue + acrylic paint), and the tail has received a tuft made from crepé hair. Macramé yarn dipped in latex tinted black, and then dry brushed with metallic paint was added as cables going from the body into the funnel head. 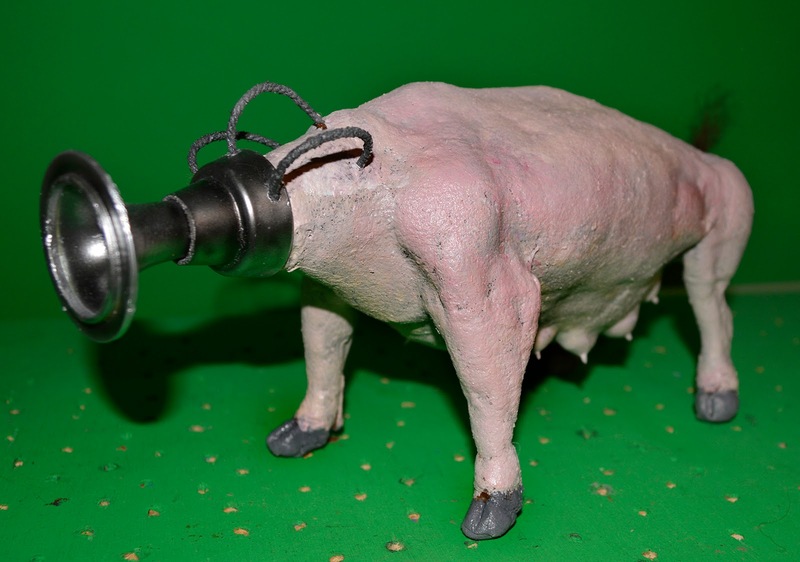 I haven't decided yet what the funnel will do, exactly. I'll probably have a nasty-looking tongue coming out of it, and maybe some sparks.